During the offseason for Top Gear, the BBC's hit motoring show watched by millions, each of the three co-hosts has their own special routines. Jeremy Clarkson drives supercars in exotic locales. James May builds houses out of Legos. Richard Hammond comes to America and destroys houses and minivans with monster machines like Abrams tanks, airport firetrucks, and excavators. 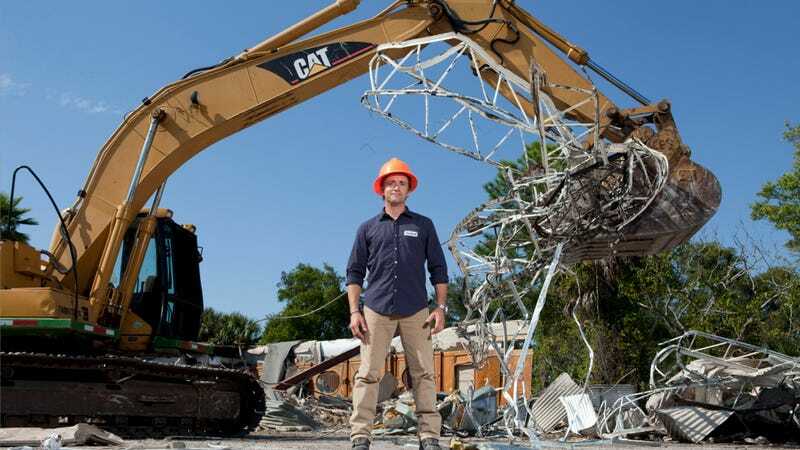 He's not mad — although he is grinning madly while I watch him tear apart a Florida house room-by-room — he's just shooting a new television series called "Richard Hammond's Crash Course." Who needs the French Riviera when you can stand in a humid, bug-infested Florida swamp in a CAT trackhoe? Here's our exclusive look from the set of Hammond's new adventure. FULL DISCLOSURE: BBC World Productions wanted me to hang out with Richard Hammond so badly they flew me to Florida, put me up in a hotel, and let me drink as much Capri Sun as I could find. I had a lot of Capri Sun. Richard Hammond is having a good time, the crew is having a good time, and I'm having a great time. He may be co-host of what may be the most popular regularly programmed show in the world, but on this hot September afternoon he's just a funny and warm guy doing slightly ridiculous things. "What I've been doing is basically bumming around America driving really big, exciting vehicles," Hammond tells me as we both swipe amorous love bugs away. The premise for "Crash Course" is fairly simple: Hammond has driven just about everything on four wheels, so let's put him in vehicles with tracks, and ten wheels, and cannons. From there the idea evolved into teaching him how — and us by extension — how hard these jobs are. "I've had to learn the basic skills before I could go on and use the massive machines," says Hammond. Those jobs include driving an M1 Abrams tank, putting out a fire with a massive airport firetruck, chopping down trees with logging equipment, and tearing down houses with an excavator, which is what he's doing today. Hammond repeatedly emphasizes his respect for the people who do these jobs on a daily basis and repeats how much harder all of this is than it looks. It's sometimes scary ("I'm not brilliant with heights") and sometimes dangerous (he accidentally hit a producer in the balls with a water cannon from the airport firetruck "he was quite surprised") and it always takes a ton of work ("I'm very sweaty on camera"). "I'm not just messing about, In each instance, I've got to learn how to use the machine to do the job it was built for…" says Hammond, before he quickly adds "I am messing about, so what it amounts to is an excuse." He can use any excuse he wants because watching the destruction while listening to Hammond's gleeful audio feed is massively entertaining, something that will hopefully translate to the small screen when the show debuts on BBC America later this spring. "The house I'm tearing down is going to be replaced by a green house," Hammond assures the viewers. "Better for the badgers, better for the environment… I'm having no fun tearing down this house… MWHAHAHAHAHAHA!" "Am I allowed to walk into the house or am I going to die?" In the episode Hammond has to destroy the house without killing a mannequin named "Nigel" who is in a center bedroom. You'll have to wait and see the episode to find out if he's successful, but one little secret I couldn't not divulge is the show's outright hatred of minivans. In almost every episode you will see a minivan destroyed. "It was so satisfying to see a minivan crushed by a trash compactor," the Executive Producer who was sprayed in the nads by Hammond tells me. I've personally asked the producers to provide me with a cut of minivan destruction before the show debuts Monday, April 16, 10pm ET/PT, immediately following the premiere of Top Gear season 18 on BBC America. I truly hope they can make that happen.